Thanks for sharing the info. Glad they apprehended a few jackholes. Death Valley, CA--On the evening of August 10th a weather event that included several dry lightning cells ignited several fires in the vicinity of Hunter Mountain in the Panamint Range of Death Valley National Park. These lightning strikes resulted in two wildland fires, the South Fire and the Pass Fire, These fires were managed as an incident called the South Complex. A total of 453 acres was burned (Pass Fire: 441 acres, South Fire 12 acres). The fires were within the Death Valley Wilderness, but were suppressed due to several factors including historic resources in proximity to the fires, on-going law enforcement operations in the area, low fuel moistures and continuous fuels, limited wildland fire resource availability in the region because of other large higher priority fires, and limited park staffing available. The fire transitioned from a Type 4 to a Type 3 Incident Command organization on August 12th and was suppressed using available regional resources (four engines, one Type 2 hand crew, one Type 2 helicopter). The fires were contained on August 16th and on August 17th all initial attack resources were released.On August 18th a precipitation event provided critical moisture over the entire fire area. The staff of Death Valley National Park along with local and regional partners were able to manage these fires effectively and efficiently with limited resources. The fires will continue to be actively monitored by NPS staff until declared controlled. 70 % of Death Valley National Park is considered "burnable". On August 9th and August 10th, NPS and cooperating agencies conducted a marijuana interdiction operation dubbed Operation Cleansweep on Hunter Mountain. Two separate marijuana grow sites were raided by NPS personnel resulting in the removal and destruction of approximately 8,000 plants. NPS personnel pursued several individuals who fled the grow sites but were unable to immediately apprehend any suspects. A wildland fire sparked by dry lightning on the evening of August 10th ultimately caused three suspects to flee Hunter Mountain. The suspects were found in Grapevine Canyon on the evening of August 11th. Two of the three were apprehended and are awaiting trial on marijuana cultivation charges. The grow sites suffered extensive resource damage, including the cutting down of over 100 cottonwood trees at one site. Future operations are being planned to rehabilitate these locations. Operation Cleansweep was the culmination of a ten-month investigation conducted by Death Valley rangers and special agents with the NPS Investigative Services Branch. Participating in the operation were NPS ISB, Pacific West Region special event and tactical teams, Sequoia-Kings Canyon marijuana interdiction group, Death Valley resource management staff, and California Air National Guard. If I remember right, it was found by firefighter fighting a fire up there. Perhaps a lighten strike fire don't know. I hadn't heard of any pot farming up there. I'd probably drive right by it though and not notice it. I'm always weary about the actions of the Sierra Club/Friends of the Inyos. They tend to work outside the rules to achieve their own goals and motives. Wonder if they removed historical artifacts they consider trash or closed roads. Thu.-Sat. 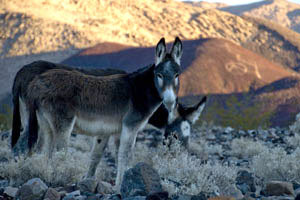 Oct. 8-10 - Death Valley Wilderness Restoration. Join us in restoring wilderness values in this remote and beautiful desert National Park by helping to clean up marijuana grow site in the Hunter Mnt area. 4WD required possibility of carpooling. Meet Thursday afternoon at the junction of Hwy 190 and the South Saline Valley Road. Work Thur. afternoon and all day Friday. On Sat, either more clean up, or we may be free to enjoy the park. Camping is primitive, bring all the food and water that you need for the weekend, plus a trowel or shovel for personal needs. Leader: Kate Allen, kj.allen96@gmail.com, 661-944-4056. CNRCC Desert Committee.